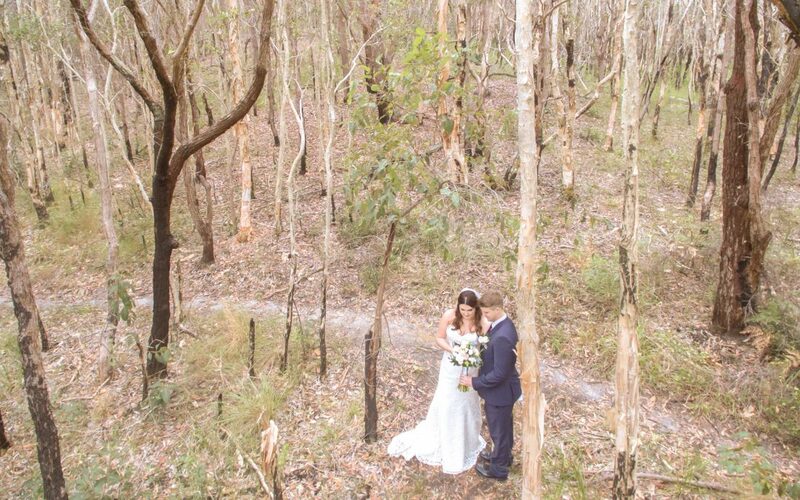 Last weekend the Gold Coast went through quite a big wet weather event, I saw pictures of weddings that were ridiculously wet, grooms standing watching their brides walk down the isle in torrential downpours even! I had a wedding on Monday and rather than worry I just prepared for the worst, umbrella’s, wet weather gear for my camera’s and me but the only thing I was sad about was the drone. You just can’t work around rain or wind with the drone, especially in tight spaces. Sunday was the worst of it, ridiculously windy and the rain was HEAVY, like I don’t even want to be undercover outside heavy! Monday rolled around and it was better, all through the day there were little showers but nothing too bad. We had to hold the ceremony inside but when it came to the portrait section no wind and no rain, it truly was some kind of miracle. As we wrapped up in the forest it started to rain heavily so the last few shots I got were under umbrellas trying to delicately and quickly put the bride and her dress in the car. The only problem a mutant spider crawled onto my shoulder and temporarily distracted me it took a lot to not run screaming from the forest! So here is my first sneak peek from the forest via the drone.